Why was a census needed? Heathens have been mostly invisible in major surveys of religious affiliation. When heathens do respond to surveys like those of the Pew Research Center and the U.S. Department of Defense, they tend to disappear into categories like "New Age" and "No Religious Preference." 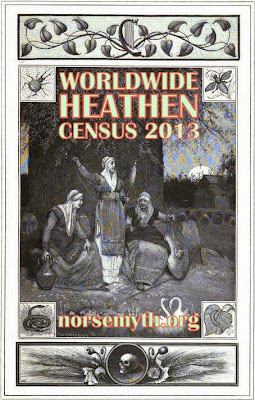 Estimates of the worldwide number of heathens vary greatly and tend to founder on the conflation of "heathen" with "pagan" and/or "Wiccan" in most surveys. In the past, attempts made by heathens themselves to gauge the actual number of worldwide practitioners of the religion have not been entirely successful. 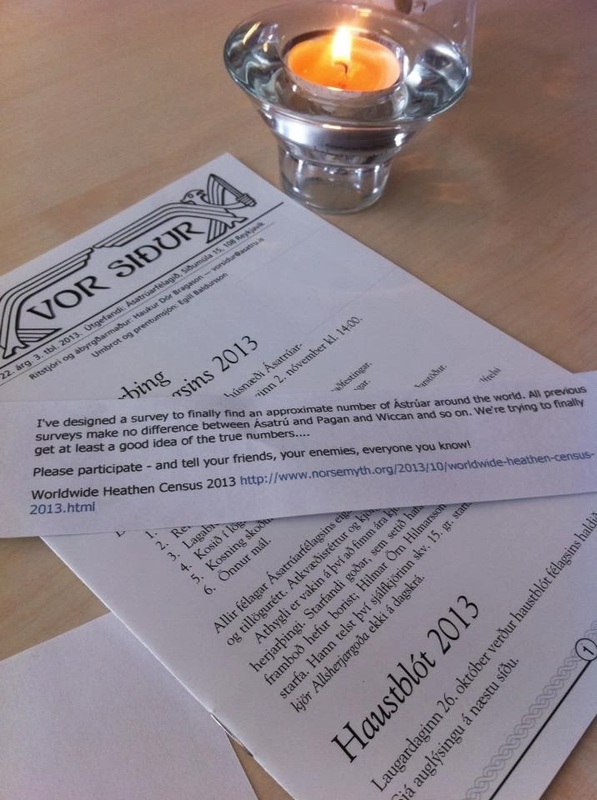 The Worldwide Heathen Census 2013 sought to establish an approximate number of adherents through an anonymous survey with only one item: a pull-down menu where the respondent selected his or her home country. It was hoped that the anonymous nature of this census would attract responses from heathens who may not want to put their name on an official form from a governmental agency or research institution. Final census results are posted below. They will hopefully serve as a resource for journalists, academics and researchers. Most importantly, the results will give at least an approximate answer to a question on the minds of many heathens: "How many of us are there?" This survey was originally called Worldwide Ásatrú Census 2013. When I contacted practitioners from different communities around the world for their input, they all agreed that "heathen" was the most general term – and that it is the term with which most adherents would identify. There are very real differences between different forms of this religion. Some practitioners are opposed to the word "heathen" itself. I respect these differences and realize how important they are. However, this census sought to – for just this one brief moment in time – move beyond these differences in order to get a sense of the worldwide community. If your preferred term was not included, I apologize. It was simply an oversight. The point is that this census was meant to include as broad a range of heathens as possible. As long as you self-identify as someone who belongs to any of these paths, I hope that you chose to participate and helped create a true representation of worldwide heathenry. There are very important differences in the way that heathens around the world approach belief, ritual and organization. There are intense disagreements on what it means to be part of this religion, of who can be a heathen and of how the faith is defined. With the greatest respect for the deep feelings people have about these issues, this was not the place to have these arguments. The goal of this census was to gather data on the number of heathens worldwide, not to start yet another argument over the nature of the religion. read "Ásatrú Definitions for Journalists"
Who participated in the census? 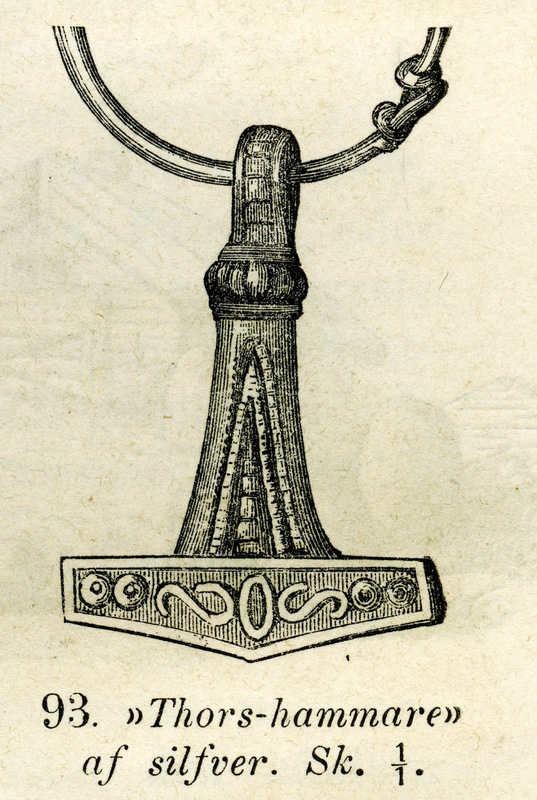 Participation was open to those who self-identify as a heathen and have heathenry as their primary expression of faith and religion – those whose core religious identity is as someone who practices any variation of Germanic paganism, as someone who honors the Æsir and the Vanir, as someone who follows the Old Way in the modern world. Those who practice a form of eclectic paganism that includes Germanic deities among veneration of a broad range of figures from other paths were asked to not participate. 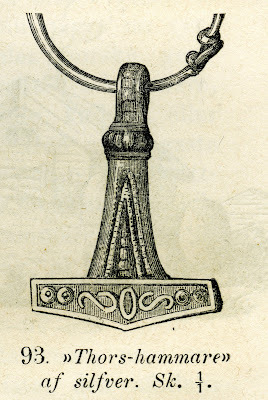 Those who venerate the Norse gods as merely one part of a more generalized pagan practice were also asked to not submit an entry in the survey. I respect their choice, but it is simply not what this particular survey was about. Purely in the interest of gathering some very specific data, I sought to move beyond the conflation of heathenry with other pagan religions – as has so often been the case in previous surveys of religious affiliation. The goals was to finally make an estimate of heathens as a distinct group, as opposed to an invisible presence within the "pagan" or "New Age" marker in more generalized surveys. How did the census work? 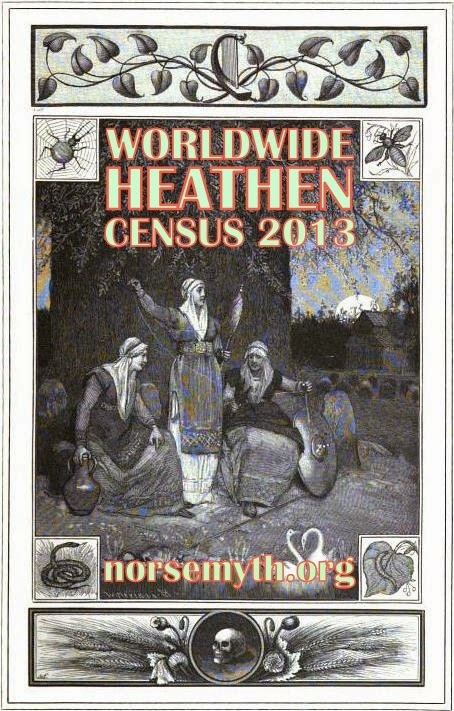 The census accepted entries via a dedicated post on The Norse Mythology Blog from October 1, 2013 through December 31, 2013. You can view the original post by clicking here, but please be aware that the entry form has now been disabled and will no longer accept submissions. The census was designed to be (1) anonymous and (2) easy. Each participant simply scrolled to the bottom of the post, selected his or her home country from the pull-down menu and clicked the "submit" button. Those who were unable to access the embedded form were given two additional means to enter the census; a direct link to the form itself was provided and an invitation to contact me directly via email was given. Participants were asked to submit responses only for themselves as an individuals. They were asked to not submit for other local heathens, fellow members of organizations, family members, etc. Heathens who are part of a community of heathens or have contact with other heathens were asked to tell others about the survey – but to not respond on their behalf. How did heathens find out about the census? Throughout the three-month census period, the survey was promoted regularly on the social media sites of Norse Mythology Online: Facebook, Google+, Twitter and Pinterest. I created a series of fifteen posters to draw attention to the census. These were featured in various social media posts that explained the census and provided a direct link to the survey page. Each poster was widely seen and shared. This chart shows the number of daily census responses. 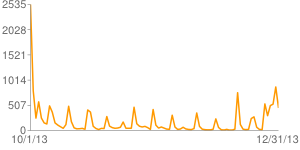 After the large reaction to the initial announcement of the survey, the spikes correspond with the regular social media posts. There is also a large jump related to the article on preliminary census results published by the Icelandic newspaper DV (Dagblaðið Vísir) on December 28. Many heathens around the world voluntarily spread the word about the census. 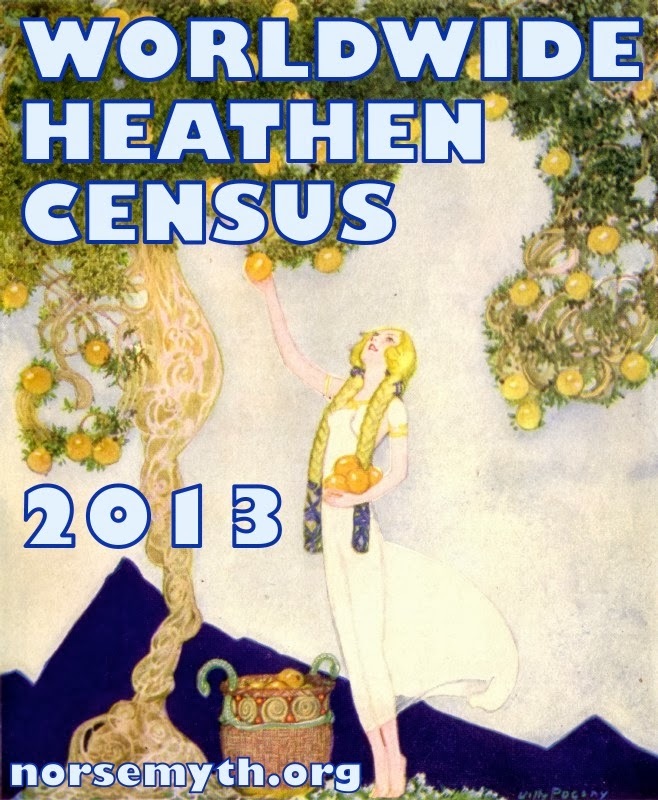 Online heathens posted links to the census in groups and forums, bloggers wrote posts notifying their readers about it, and large heathen organizations asked their members to participate. I received personal emails and messages about the census from members and leaders of several heathen groups around the world. Some heathens went above and beyond in their support for the census, and some took the census from the online world to the real world. At the large annual meeting of Iceland's Ásatrúarfélagið (“Æsir Faith Fellowship”), slips of paper announcing the census were printed out and handed to members. I am extremely grateful to everyone who participated – and especially to everyone who helped spread the word and encouraged their fellow heathens to enter. Skál! What were the final results? How can we interpret the results? I created the following infographic to help make sense of the census results. The charts are all interactive; simply hover your cursor over various elements to see details. If the infographic fails to load after a decent amount of time, click here to view it offsite. How do the census results reflect previous estimates? Some past estimates of heathen numbers now seem wildly off the mark. They have either been based on conflation of heathens with other pagan groups or on (completely understandable) emotional desires to make a minority faith seem larger than it actually is. As of 2001, the City University of New York estimated that some 360,000 people in the USA self-identify as "Pagan" (excluding Wiccan (134,000), New Age (68,000), Druid (33,000), Spiritualist (116,000) and aboriginal religions (4,000)). The citation leads to a dead webpage yet appears to be referring to the Graduate Center of the University of New York's "American Religious Identification Survey 2001." While the census uses the terms Wiccan, Druid and Pagan, there is no mention of heathenry, Ásatrú or any other variation of Germanic paganism. This particular Wikipedia page seems to be in the midst of long-term edit wars, and it remains unclear why these numbers (unrelated to any form of heathenry) are included at all. Árið 2001 áætlaði Borgarháskóli New York að eingöngu í Bandaríkjunum væru um þrjú hundruð og sextíu þúsund ásatrúarmenn. In 2001, the City University of New York estimated that there were about three hundred and sixty thousand heathens in the United States alone. Wikipedia nonsense is actually having a powerful effect, now that some journalists are using it as an unquestioned source of information – and not even mentioning in their articles that their "facts" are taken from the site. Just to be clear, the "American Religious Identification Survey 2001" does not state that there are 360,000 heathens in the United States. Still, this fictitious 360,000 number is a drop in the ocean compared to my personal favorite estimate: the commenter on The Norse Mythology Facebook Page who insisted that there are "billions and billions of heathens worldwide – billions in the United States alone!" Considering the fact that the planet only has about seven billion inhabitants and the United States currently has a total population of about 313 million, these might be slightly optimistic numbers. What message do the results send? I hope that the census results will get the attention of the professional survey takers like the Pew Research Center, of government groups like the President’s Advisory Council on Faith-based and Neighborhood Partnerships, of interfaith organizations like the Interfaith Youth Core, and of the many other institutions around the world that claim to have inclusive religious policies but do not seem to notice that heathens actually exist. The heathen community may be small, but it is a very real tradition with members around the world. The respect due to a religious community and its inclusion in the worldwide faith discussion should not be based on the number of adherents – or on amount of funding or political influence, either. I look forward to a day when heathens are held in the same regard as members of any other faith tradition. A wonderful take-home message from the census is that, when there is something positive for everyone to work towards, the often furious disagreements between various branches of the heathen community can be temporarily put aside. I was very glad to see posts by and receive emails from people who don't agree with my approach to mythology and heathenry, yet still took part in the census and urged their friends to do so, as well. I was very happy to see members of diametrically opposed heathen communities urge people to take part in the survey. I have no illusion that everyone will hold hands and dance around the midsummer bonfire together, but it's nice to know that there was – at least for a moment – some common ground that everyone could share. For man is man's delight. Thank you for doing the census and compiling the various relsults and extrapolating so many various views of them. It is an enormous undertaking! 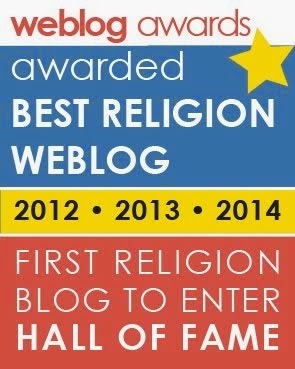 Hail to the modern heathens! Hail the ancestors! 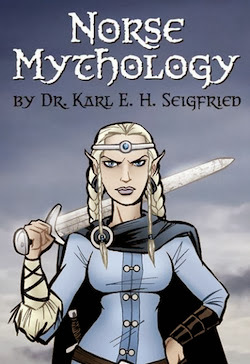 Hail to Norse Mythology blog! Great work on the survey. Your efforts are greatly appreciated (speaking for myself at least). Is it possible that you may do this again for 2014, to show progression? This is brilliant, thank you for taking the time and effort to make this happen! I've always suspected there's a lot more Heathens out there than are involved in official organizations. The multiplier of 2.173 seems about right, putting the global population at around 33-35k. It might even be higher for all we know given the comparative underground status of Heathenry compared to more mainstream religions. This is invaluable information. I hope in future censuses (censii?) you might consider putting in some demographic questions to get a fuller picture. I ran through some of the implications of your numbers on my own blog. If my sums are correct, there should be about 50 Heathens in easy driving distance of my home. There's really no excuse for there not to be a *lot* more organization and activity out there. Wow, I'm really surprised that there are so many Heathens in Australia - out of a population of 23 million, we are doing well! Thanks for all your efforts that went into the census. Note that the study has been misrepresented on Wikipedia, and the corrected statement would be that in 2001, an estimated 140,000 self-identified as pagan. I am trying to imagine what life is like for the 1 heathen in Pakistan and the 3 in Iran! Wow! Will there be another census? Would love to see a run down of percentages of different paths too. Great work was shocked to see so many Aussies included. Maybe it is time for a new census, 5 years later and it would be a great comparison especially for countries like Australia etc.